The Wilson Housing Authority, in partnership with the City of Wilson, was awarded a $200,000 planning grant from the U.S. Department of Housing and Urban Development (HUD) under its new Choice Neighborhoods Initiative. The Housing Authority and the City of Wilson each matched that grant with $100,000, bringing the total funding for planning to a robust $400,000. Choice Neighborhoods grants transform distressed neighborhoods and public and assisted projects into viable and sustainable mixed-income neighborhoods by linking housing improvements with appropriate services, schools, public assets, transportation, and access to jobs. A strong emphasis is placed on local community planning for access to high-quality educational opportunities, including early childhood education. 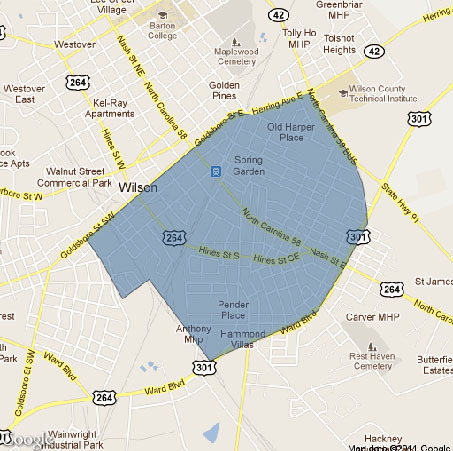 Project Summary: The Housing Authority of the City of Wilson and the City of Wilson developed a Transformation Plan for the neighborhood around Whitfield Homes. In the Center City neighborhood, Whitfield Homes is the only large multifamily public housing property and is isolated from the rest of the community. Center City has a poverty rate of over 50 percent and an unemployment rate of 46 percent. Despite the neighborhood distress, the area has several key assets including new residential construction (Freeman Park) and commercial developments, a planned park and greenway that will tie the Whitfield site to a major new recreational area traversing much of the city, the city Transit Center and Amtrak station, a recreation center, early education center, community college, and the new Whirligig Park, which opened in 2017. The Choice Neighborhoods planning process focuses on partnerships necessary to carry out neighborhood redevelopment, including the development of a financing plan and phasing model, reconnecting Whitfield Homes to downtown, strategies to make available community and supportive services to residents throughout the target area, creating momentum for the private sector to revitalize and rebuild downtown retail businesses, and establishing a strong early childhood education anchor institution that provides high-quality education to local children. Transformation Plan accepted by HUD and approved by City Council. WHA purchased the former elementary school adjacent to the Whitfield Public housing site from the Wilson County School System. WHA then entered into an agreement with St. Johns CDC to expand its after school program and at risk alternative education programs in this building. The agreement also allows for all public housing residents to participate in any of the programs at no charge. Wilson Community College has acquired a vacant property adjacent to the target area. They are building a state of the art automotive repair college with an emphasis on electric car technology. This will lead to a more educated workforce. New private investment throughout downtown Wilson. Vacant buildings are being converted to market-rate live/work units. Two buildings have been renovated and are now fully leased. Several other buildings are in the planning stages for similar projects. Through Brownfield grants received by the City of Wilson, environmental assessments and cleanup of former petroleum company sites were completed in the target neighborhood. New retail buildings have been constructed on these sites and are providing much needed opportunities to the adjacent Whitfield residents. WHA has begun planning for the construction of new multi-family housing units in the Whitfield Homes Community. This new construction will be funded by a combination of funds the WHA has on hand and grants it has secured to build new affordable housing in the counties impacted by Hurricane Matthew. Construct new public housing replacement units for our units that were impacted by Hurricane Matthew in 2016 and move our residents from the units currently located inside of the 100 year flood zone. Those units will be turned over to the city and demolished to make way for parkland and green space areas. Continued work with the 301 Forward group to redevelop HWY 301 to make it more pedestrian friendly and to improve the appearance of the corridor.